January 26, 2000 -- Just 2 million light years away lies Andromeda, a big beautiful spiral nebula that is the nearest major galaxy to the Milky Way. It's so nearby, in fact, that you can see it with the naked eye on a dark night as a faint fuzzy blob in the northern sky. Andromeda is probably the most thoroughly studied galaxy in the sky -- second only to the Milky Way itself. Much of our own galaxy is hidden from view by dense clouds of interstellar dust. Andromeda gives astronomers a chance to look at a young spiral galaxy from the outside, to see the complete picture that's hidden from us in the Milky Way. Above: The diffuse light from the Andromeda galaxy is caused by hundreds of billions of stars. The several distinct stars that surround Andromeda's image are actually stars in our Galaxy that are well in front of the background object. Andromeda is frequently referred to as M31 since it is the 31st object on Messier's list of diffuse sky objects. When NASA's Chandra X-ray Observatory was launched in 1999, many astronomers were understandably anxious to view the first high resolution X-ray pictures of the Milky Way's nearest galactic neighbor. Earlier data from the Hubble Space Telescope had revealed a black hole candidate in Andromeda's nucleus weighing in at 30 million solar masses. If there really was a supermassive black hole there, then there should be an X-ray source betraying its presence. Why does a black hole emit X-rays? It's not really the black hole itself that shines as an X-ray source. Stars and interstellar gas in the vicinity of the hole can be trapped by its powerful gravity. As matter spirals in toward the hole, much like water flowing down a drain, it heats up to millions of degrees and begins to glow in X-radiation. The disk of material that surrounds a black hole is called an accretion disk. Chandra took its first X-ray picture of Andromeda on October 13, 1999, and there were more than 100 individual X-ray sources in the image. Most of them are thought to be binary star systems, but one was located precisely at the galactic center just where the black hole ought to be. This greatly strengthens the case for an awesome concentration of mass at Andromeda's center. The black hole candidate in Andromeda is big -- 30 million times more massive than our Sun -- but it's not a record setter. Some active galaxies appear to harbor black holes in their nucleus that register between 100 million and a billion solar masses. Andromeda's black hole appears to be remarkable for a different reason. Data from Chandra's advanced spectrometer showed that the temperature of its accretion disk was just one million degrees. By everyday standards on Earth, that's hot. 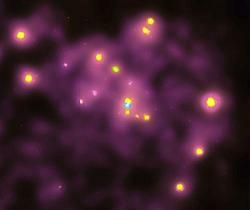 But to X-ray astronomers it's very cool. Matter doesn't even register on an X-ray telescope until its temperature reaches about one million degrees. For comparison, the other sources in the Chandra image register a sizzling 10 million degrees. They are probably binary star systems in which a normal star orbits a neutron star or a small black hole. The normal star feeds matter to an accretion disk around its dense companion, resulting in X-ray emission from the hot disk. These systems weigh in at just a few to a few tens of solar masses. Theorists expected the accretion disk around the central massive black hole to be at least as hot and energetic as these lightweight systems. "The Chandra observation is telling us that an entirely different flow pattern [must be] operating around the Andromeda black hole," said Dr. Eliot Quataert, of the Institute for Advanced Study, Princeton, N.J. "This will require a different class of models than we usually consider." One possibility is that the gas undergoes a large scale boiling motion which slows down the rate at which gas falls into the black hole. The best previous X-ray pictures were not sharp enough to clearly distinguish the stars near Andromeda's center from the black hole, nor did they give information about the temperature of the source. Chandra has changed all that. "A good analogy might be to say that previous X-ray images were taken with a slightly out-of-focus black and white camera, while the Chandra image is taken with a sharp, color camera," said Stephen Murray, a member of the Harvard team studying Andromeda. "This is just a first, quick look at our nearest Milky Way analog. 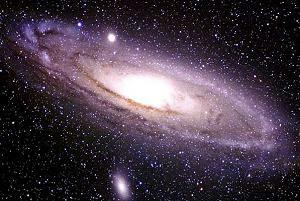 I expect that our future pictures will lead to more exciting discoveries in the Andromeda Galaxy."